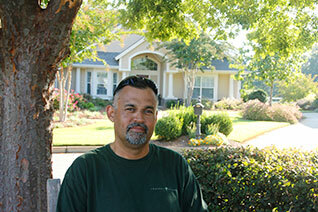 José manages many of our landscape maintenance projects, working with crews to ensure that our clients get the most out of their outdoor living environments. José’s career has included supervising services for community campuses, commercial properties and private residences. With over a decade of field experience, José’s understanding of garden maturation gives him the ability to predict timetables for modifications, enhancements and renovations. His great communication skills put him on the team, providing orientation for design and installation co-workers when they initiate improvement projects. Skilled at troubleshooting problems in the landscape, José provides accurate and timely diagnosis of horticultural problems, whether caused by pests, drainage conditions, or some other problem. José comprehends and employs workplace practices that keep his co-workers and our customers healthy and safe.